It’s been awhile since I posted anything about other artists or authors, but since the new Sarnath page isn’t quite finished yet — it’ll be just a bit longer!! — I wanted to post about the one thing which, more than anything else, got me into H.P. Lovecraft. 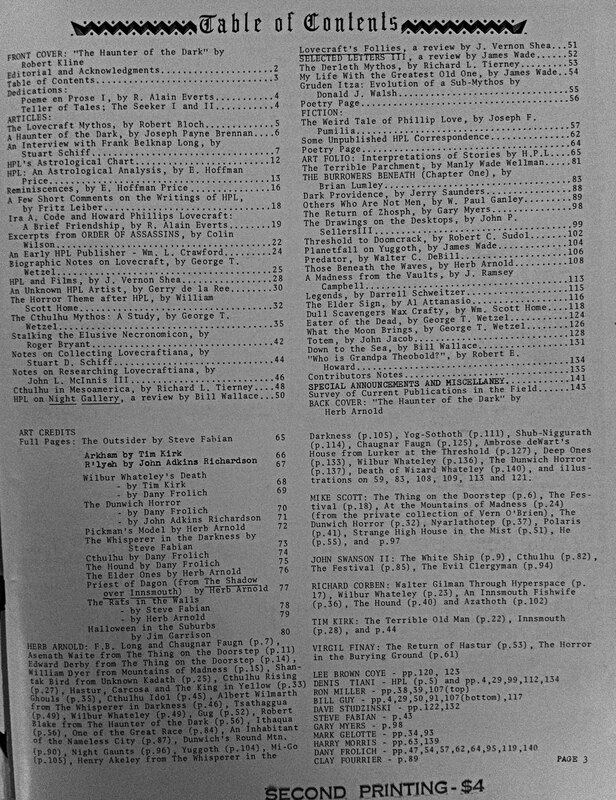 That would be the 1972 one-shot fanzine (more like fan-anthology) HPL, edited and put together by Meade & Penny Frierson. My dad owned a copy of this book (as well as the ‘second printing’ which I believe was printed in the ’80s). It’s in pretty awful condition now after following me around for 15 years, and after I leafed through it for hours after discovering it on his bookshelf when I was about 10. At the time, I hadn’t yet read any Lovecraft stories, so I just wondered at the artwork and the cryptic writing. Essays on Lovecraft, poetry, Mythos fiction — this book had everything. 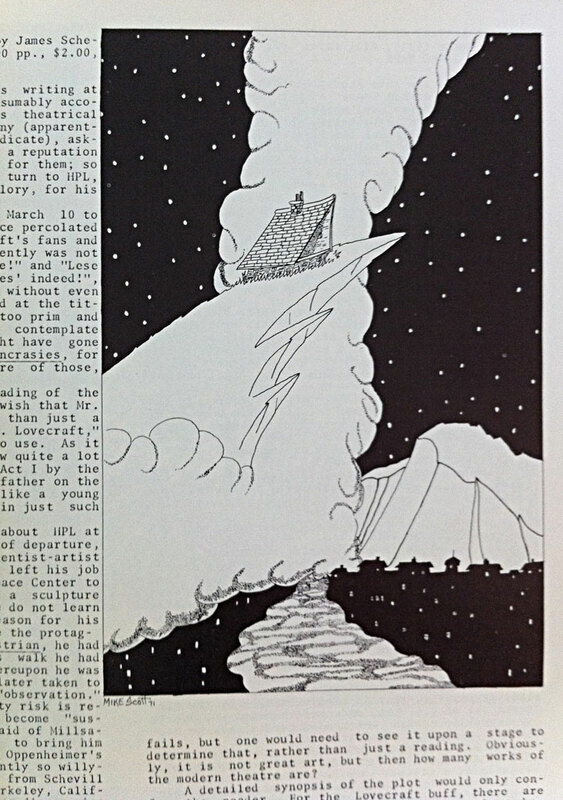 There were many major Lovecraft fanzines published in the ’70s and ’80s, before the Internet took over all that action. The two longest-running and most influential were probably Robert Price’s “Crypt of Cthulhu” and S.T. Joshi’s (well, it felt like it was Joshi’s) “Lovecraft Studies.” Possibly the most beautiful and far-reaching of them all was “Nyctalops”, published by Harry O. Morris, which started as a pretty straightforward Lovecraft zine (or so I guess; the early issues are really hard to find) and mutated into a zine about surrealist and other forms of dark non-splatter horror, which published, as far as I’m aware, the first work of Thomas Ligotti. I discovered all these zines when I was just entering college in the early ’90s; I sent letters to the ‘zine list in the back of “HPL” and, although the list was 20 years out of date, I actually got a few responses. Here’s a link to the table of contents. HPL contains a bit of everything, and it’s almost all good: an interview with Frank Belknap Long. Robert Bloch talking about how cool Lovecraft was. (They were both alive back then.) Reminiscences on HPL by E. Hoffman Price, including possibly the first transcript of the “Lovecraft couldn’t believe that two men could drink a whole six-pack of beer” story, which Price told at some convention panel. Price’s astrological chart of Lovecraft. Reviews of the Lovecraft Night Gallery episodes, the play “Lovecraft’s Follies”, and the various awful Lovecraft movies. A big essay by Richard Tierney on the differences between Lovecraft’s and Derleth’s Mythos. “The Horror Theme after HPL”, a great essay by William Scott Home, which introduced me to the idea that “The Beast in the Cave” was about the terror of puberty (remember also, I was about 11 when I read this! The essay was like foreshadowing!). Then there’s the poetry, fiction and humor, like the ad for the Lovecraft cookbook, “The Skulker in the Scullery”: “Fade away to nothing on 15 cents a day!”. The fiction varies, from Manly Wade Wellman’s dumb story (in which the Necronomicon is defeated by holy water; it certainly ain’t no “Desrick on Yandro”) to a fair amount of forgettable stuff set in 7-point type to some cool finds. Brian Lumley contributes the first chapter of his Cthonian novel, “The Burrowers Beneath.” Ramsey Campbell, the master of psychological horror, contributes… an extraterrestrial weird-fantasy story?!? A brief note explains that Gahan Wilson said he doesn’t contribute to fanzines, but that the publishers got in touch with them and he wished them well and said, yes, he loves H.P. Lovecraft. Gary Myers’ “The Return of Zhosph” appears here for the first time (together with an illustration by a very young Myers himself!). L. Sprague deCamp contributes poetry. Literally everybody who was alive in the ’70s is in this thing. But the best thing about this book, and the biggest influence on me when I read it, was the art. These were the first images of Cthulhu, Deep Ones, the Dunwich Horror etc., that I had ever seen, since I hadn’t read the stories themselves yet. The list of artistic contributors is as impressive as the authors: Tim Kirk. Steve Fabian. Virgil Finlay. By far the most prolific contributor is Herb Arnold; not the sculptor of found objects who has a posthumous website, but another Herb Arnold, a now-obscure comic artist. Arnold’s beefy, delicious crosshatched renderings of ghouls, Deep Ones, Elder Things, Chaugnar Faugn and frankly just about every Mythos thing imaginable, fill the book. 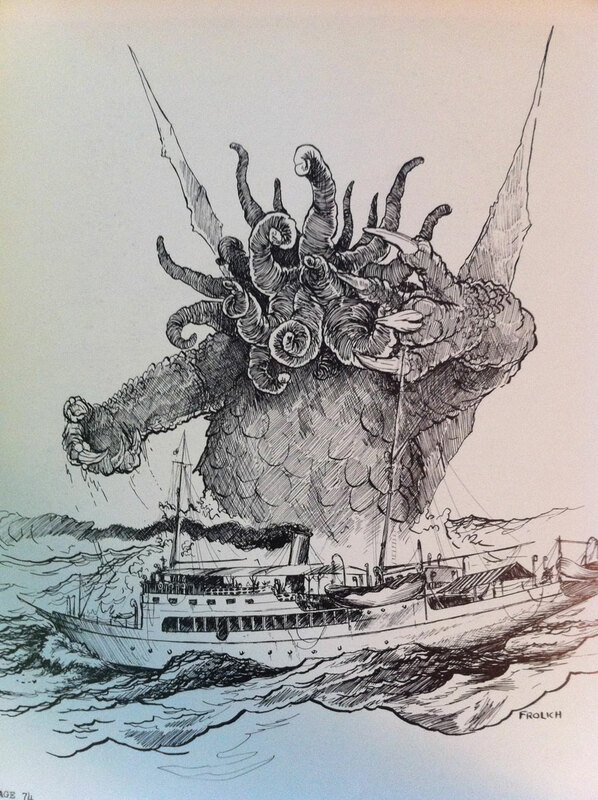 I haven’t been able to find much information about him, except that he was apparently an assistant to Richard Corben… and lo and behold, here’s Corben’s drawing of Azathoth! Your love for Lovecraft is thrilling. It is the only way I can describe it because I love him as much as you. It makes me feel like I have a kindred spirit. 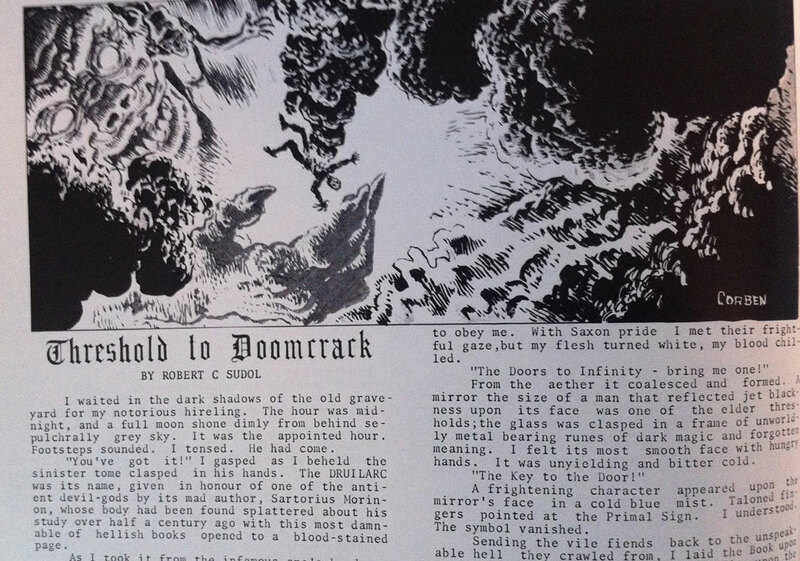 My first exposure to Lovecraft was through my dad’s underground comix I would find in his huge antique roll-desk (bottom drawer on the left). SKULL COMIX published Richard Corbin’s adaptation of “The Rats in the Walls” & not only did I get hooked on H.P., but Corben as well. I showed the short to my dad & his reply was to hand me these three beat up paperbacks with the warning not to read them when it was dark–ESPECIALLY DURING A STORM! They were Ballintine’s collection of Lovecraft’s works & I just couldn’t get enough of them. I confess I preferred the days when Lovecraft was more of a cult figure–known to a select few. But it was probably inevitable he would become part of popular culture. I mean, stories as strange as his will just grow in popularity just by the gradual rise to mainstream from word of mouth advertising. Thank you for creating your own adaptation of Lovecraft’s epic “Dream Quest….”. I find myself reading it over & over–mesmerized. It is, by far, my favorite graphic adaptation–rising above Corben. Again, thank you. P.S. Have you ever thought of adapting Clark Ashton Smith? Thanks so much, I’m thrilled that you like “Dream-Quest”! If you manage to make it to Stumptown Comics Fest in Portland next year, I’ll probably be there! I heard that “Skull Comix” has some of Herb Arnold’s other work as well, but I’ve never seen it (the only actual vintage underground comic my dad had was “Mickey Mouse and the Air Pirates”). I will definately check out that C.A.S. podcast. I find Smith to be a great “Zig” to Lovecraft’s “Zag”, while there is much shared vision within their cosmic nightmares–Love it! No. I have not seen your adaptation of “The Tale of Satampra Zeiros” but I must. Where could I find it? Online? Hardcopy? My Indy comix company has been showing at Stumptown since 2007 so, yes, I’ll be there with the crew. I’ll bring the SKULL COMIX & SLOW DEATH COMIX I have with Corbin’s work in them–including Lovecraft adaptations–so you can check them out. You must see them if you haven’t already–brilliant stuff! I used to own every volume of THE LETTERS OF H.P. LOVECRAFT published by Arkham Press & I noticed some of his return addresses were in my hometown, Cleveland, OH. This was back in ’86 when I was still in high school so my best friend & I headed downtown to Lovecraft’s address. We found it & even though we dreamed of finding a weird house suited for our dark, cosmic idol, we came to an empty lot with patches of grass scattered here & there. We made sure we stood in every square foot of that lot–just knowing we were occupying a space where he could have been. We later found out the house was burned during the civil unrest of the 1960’s resulting in huge riots. It was about the journey, you know what I mean? Do you have Corben’s Marvel Comics collection of his Lovecraft adaptations? I believe he did one for Poe as well. I’d love to see him adapt Smith or The King in Yellow. That’s really fascinating that you found the old house of one of Lovecraft’s correspondents… I guess the closest I’ve come to that is when I visited Auburn, CA to find Clark Ashton Smith’s house some years ago. It’s pretty much the exact same type of climate and landscape as the California town where I grew up, so it all looked strangely familiar. Other folks than I have done blog entries about Auburn and posted Smith photos and travelogues (there’s really not much sign left of ‘im, but there are two or three plaques in random locations around town). I never saw Corben’s Lovecraft collection. His most recent work that I’ve read was “Ragemoor” and his “House on the Borderland” adaptation, both with Jan Strnad. He’d certainly do a great job with Smith. 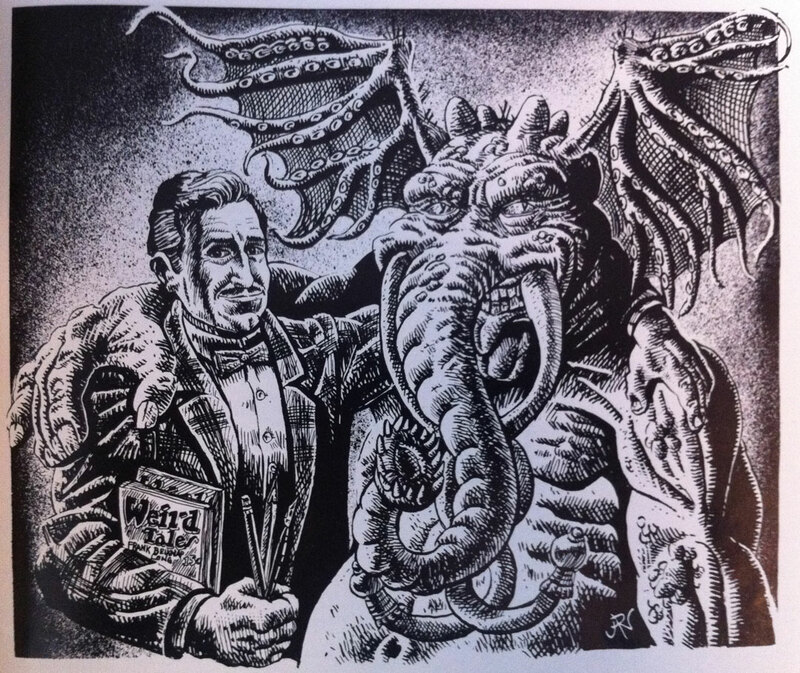 Did this fanzine have a Corben illustration of Wilbur Whateley? Afraid not… Corben did a couple of small pieces, but only a headshot of Wilbur Whateley. Some other artists drew a full-body.